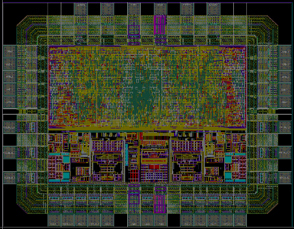 The Nanoengineering/Nanoelectronics department brings together three areas of activity at INL, systems engineering, spintronics and nanodevices, bridging the full value chain starting at the transducer/sensor level (using the electron charge and spin, or the molecular optical or magnetic spectral fingerprint to convey information on local fields and environments) to the system level ( including discrete or integrated electronics) to address major challenges in industrial sensing, RF communications, biomedical devices (biosensors and control systems), and agri-food and environmental monitoring applications (IOT, sensor networks, integrated molecular fingerprinting systems). 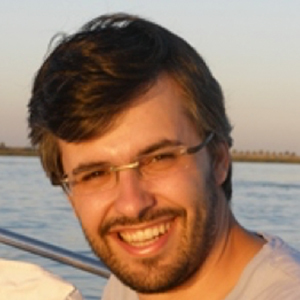 The department includes 2PIs and the Department head, 3 research staff, 4 engineers, 3 post docs, 5 PhD students in collaborative programs with various universities (IST-INESC MN, U Porto, U Minho, U Santiago de Compostela), and has hosted during 2016, Master and summer students, 3 long term visitors (stays over 1 year-Capes Brasil) and 3 exchange visitors from IBM Zurich, U Regensburg, and the Technical University of Denmark. 3 process engineers from Lertech/CN work at our facilities. The various groups were involved in 2016 in 4 european projects (FP7 SpinICUR MC training network, FP7 MOSAIC, SpinCal, and a ENIAC project in collaboration with J Gaspar in the NanoFab), and a variety of cross border, regional, national, and industrial projects. Circulating tumour cell (CTC) trapping and enumeration. A microfluidic linear pillar array separates CTCs from other blood components ( in collaboration with Lorena Dieguez). 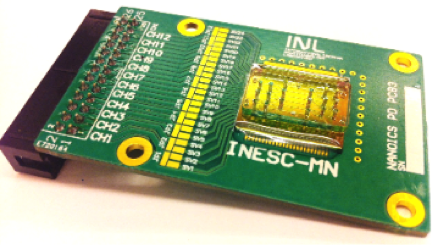 A magnetoresistive cytometer (chip done at INESC MN) is then used for labelled CTC enumeration. 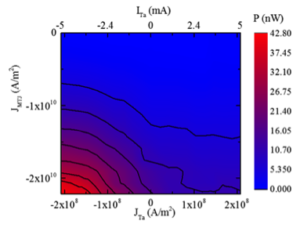 INL demonstrated dynamics in MTJ nano-pillars generated with a pure spin current and a power larger by a factor of 20x with respect to the only report showing similar results. Combining Spin Transfer with Spin Hall, new dynamic states can be reached. Schematic illustration of the microfluidic sensor integrated with after-channel UV/vis spectrophotometric detection for food ingredient analysis. 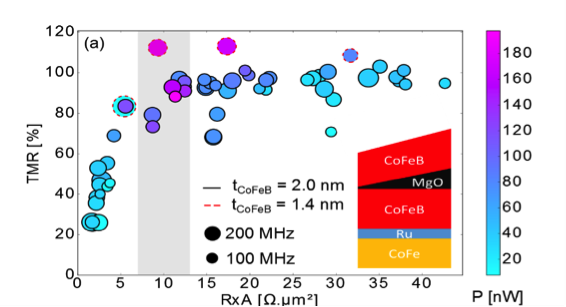 (b) Collected absorbance change at 266 nm of solutions containing only caffeine, and mixture of AA and caffeine before (A0) and after (A) passing through the enzyme-loaded microfluidic sensor at 5 μL/min. 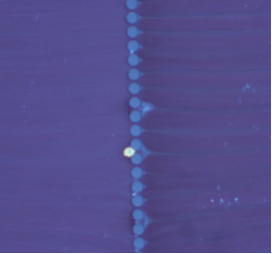 Arrows indicate the time when it is started to sample the solution through the microfluidic channel. 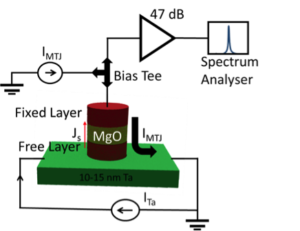 “Impact of MgO thickness on the performance of Spin Transfer Torque Nano-Oscillators”, J. D. Costa, S. Serrano-Guisan, J. Borme, F. L. Deepack, M. Tarequzzaman, E. Paz, J.Ventura, R. Ferreira and P.P. Freitas, IEEE Trans. Magn., Vol. 51, N. 11, November 2015. “Development of microscale, in-situ NMR system. 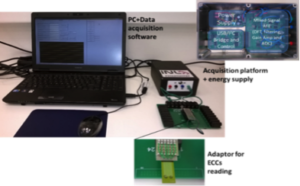 (a) First generation benchtop sized NMR system, which utilises a low-cost 0.5 Tesla permanent magnet, and a microcoil radio-frequency probe. Proton nuclei spin relaxations of water molecules can be used as a highly sensitive and specific molecular probe in biological fluids (e.g., red blood cells). (b) Less than 1µL of analyte is needed, and analysis typically completes in less than 5 minutes. (c) The second generation handheld micro NMR system roughly the size of a tablet. The system is controlled by using a field programmable array, powered by a 1 Watt amplifier chipset and a low-noise pre-amplifier.